Once the excitement of an engagement wears down, couples often turn their attention to planning the big day.There's venue shopping, the struggle of creating the guest list and picking out the dress, to start. What's often forgotten until the last minute, however, are any desires to get in shape before the wedding. "I think sometimes, when people are preparing for a wedding, they are so consumed by the details -- the dresses, the flowers, the caterers -- that they don't realize they want to lose weight until three weeks out," Samantha Heller, a registered dietitian and exercise physiologist at NYU Langone Medical Center in New York City, said to CBSNews.com. "They wait until the last week, and might do something drastic like a crash diet, or cleanse." Panicked and out of time, brides and grooms-to-be may turn to unhealthy measures to lose weight. However, experts say those efforts can backfire and ruin the experiences leading up to the big day. 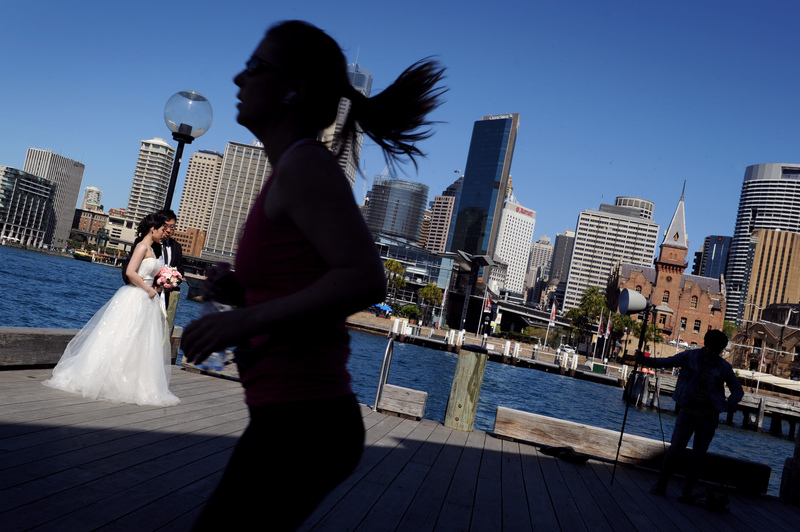 To get in shape for a wedding, Heller advises to start preparing as soon as you get engaged. "Start now," she recommended. "You want to get in the groove, so this something you can keep forever." But first, people looking to shape up for their wedding need to have realistic expectations. "Expectation management is really huge," Dr. Jamie Kane, medical director of Park Avenue Medical Weight & Wellness located in New York City, explained to CBSNews.com. "Some people have unrealistic expectations and want to take off 40 pounds in six weeks -- I don't touch that." If weight loss is your goal, two pounds a week is a safe target, Kane said. He works with patients with serious weight issues and other health complications, but also offers a "wedding dress diet" for those who are about to get married and have a different set of expectations and discipline. Terri Walsh, a certified personal trainer in New York City, also needs to temper some clients' expectations if they come to her with two weeks to go until their wedding with lofty weight loss ambitions. "I can get them starting off the right foot in two weeks, but it's just not worth the short-term diet to mess up their metabolism," Walsh told CBSNews.com. "You can only fix so many years of neglect in a couple of hours." Kane's weight loss program focuses on changing the foods that prospective brides are eating so they can reduce calorie intake and body fat. He first looks for sources of "hidden calories," or things that have very little nutritional value but can pack on pounds over time. For example, he may tell a bride-to-be to remove cream and sugar from her daily coffee, not add cheese to meals, or drink only non-caloric beverages like water. He also encourages his almost-newlyweds to increase their fiber intake to spike their blood sugar and insulin, which in turn boosts metabolism. Heller pointed out considering what lots of people are eating these days -- one recent study found fast food made up about 25 percent of the U.S. diet -- simply swapping unhealthy foods for healthier alternatives like non-starchy vegetables, whole grains like quinoa, and healthy proteins like edamame, beans, eggs, low-fat cottage cheese and plain non-fat yogurts, can lead to about one pound of weight loss per week. Walsh, who has clients that include brides hoping to fit into their dresses and celebrities who are constantly on camera, offers an "A-List Body Boot Camp" that is popular with brides. She recommends to her clients a diet consisting of proteins and vegetables in order to increase lean muscle mass. She also advises them to stay away from starchy carbohydrates, bread, alcohol, juices and liquid calories. The trainer asks her clients to bring in weekly food diaries, so she can illustrate what eating and binge drinking during bachelorette weekend might do to a waistline. "When you see your waist drop by a couple inches...without eating potatoes and pasta -- it's a lot easier to do something when you see it works," said Walsh. "That's why we measure them weekly." What you should do, the experts agreed, is eat enough food, and not starve yourself or go on a crash diet -- or something even more extreme. Last year, the New York Times reported some brides are turning to a so-called "K-E diet" in which a feeding tube is inserted so they don't have to eat meals. For the procedure, a nasogastric feeding tube is deployed through the nose down the esophagus and into the stomach, where it can pump in a mixture of a protein-rich, low-carb formula to brides that amounts to 800 calories per day. The 10-day regimen costs about $1,500, and was criticized by many doctors when the story broke. "I'm horrified by that," said Heller. Generally, going on a crash diet or even skipping breakfast can have the opposite effect, Kane said. While some short-term weight loss may occur, dramatically curbing calories might lead to a cascade of hormones that cause people to end up retaining more fat. Heller added that if you're skipping meals and no longer eating at regular intervals, metabolism slows down because the body thinks it is starving and tries to retain nutrients longer. On the other hand, eating healthy foods throughout the day can keep the metabolism going, she said, so your body can stay in a "weight-loss zone." Besides causing more weight to come back, a crash diet might also lead to dehydration, gallstones, kidney stones, low blood pressure and electrolyte disturbances that might be dangerous. Many young, healthy brides may not think health problems can happen to them if they drastically cut back on calories for a few weeks, and may ignore the warnings. But, what they might notice is the feeling of unhappiness during what is supposed to be one of the happiest times of their lives, Heller pointed out. Skipping meals or crash dieting can cause a happy bride to turn into a "bridezilla," she said, feeling hungry, cranky, more tired, and having fewer coping skills as her mood deteriorates. "That's the last thing you want," said Heller. "You want even the planning of this to be fun." Swapping out unhealthy foods is just one part of getting in shape for a wedding. The experts agreed that exercise is also essential. Kane points out that losing weight can also lead to losses in muscle mass, which is why exercise is necessary if shaping your body is your goal. Walsh, the trainer, created the "Active Resistance Training" method (ART), a system she developed during her almost 30 years of experience. ART involves working out four specific resistance points in the body with cardio, toning and other exercises. Her bridal boot camp consists of sessions five times a week that are custom-designed to work a bride's "trouble zones." Some brides even come in with pictures of their dresses so Walsh can assign exercises that target areas that may be more visible in the gown, she said. Walsh tells her clients that her boot camp isn't a collaboration, and they have to trust her, show up when she tells them, and eat and exercise as instructed. But, adhering to the boot camp is rarely an issue with her brides -- she said they tend to be the most motivated bunch. The other experts agreed that people trying to get healthier with a wedding in mind tend to be a more motivated than the typical New Year's resolution crowd. As Walsh says, "The golden phrase for motivating a bride is 'pictures are forever.'"